Are Hearts and arrows diamond worth it? 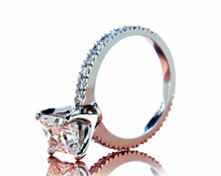 Almost every woman recognizes the statement of love made with a diamond. Where words end, the beauty and brilliance of a Brian Gavin Signature Hearts and Arrows Diamond will only have begun to express the depth of your feelings. It is a perfect symbol of your unfailing love and a tribute to the strength of your commitment, containing all the fire and passion your heart holds. Make a bold statement. 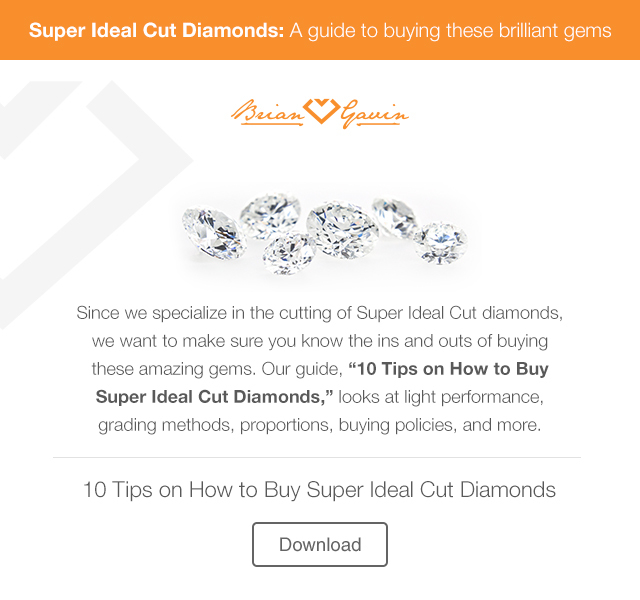 Choose a Brian Gavin Signature cut diamond. “Really, you don't even need to ask about quality or performance with Brian Gavin. All of his signature cut diamonds are stunning.” Marilyn H.
When selecting a diamond, you have many choices and options. Beyond the basic “4 Cs” (carat, color, clarity, cut/shape) used to measure a diamond’s quality, there is another level of excellence and perfection that involves the symmetry and reflective quality of a diamond’s cut - another “C” that affects and potentially enhances all the others. The cut determines how well a diamond “performs,” how well it reflects light under a variety of lighting conditions and situations. Practically any stone will look impressive under the bright spotlights of a jewelry store, but a rare few have the unique combination of precise cut, shape, and angles to hold their brilliance in more natural lighting situations. This is what distinguishes Brian Gavin Signature Hearts and Arrows Diamonds – diamonds that embody the perfect marriage of brilliance, fire and dazzling scintillation, unrivaled by ordinary diamonds. Where words end, your Brian Gavin Signature Hearts and Arrows diamond will carry on, adding new, unending expressions of your love. Brian Gavin is a fifth generation diamond cutter and creator of his internationally renowned Signature Hearts and Arrows diamond. Being a recognized authority and consultant on diamond cutting and jewelry design, you are assured of both superior quality and service backed by the knowledge and expertise of five generations of expert diamond cutters. Heritage, history, trust, world-renowned expertise - and the most beautiful diamonds available in the world - that’s the mark of a Brian Gavin Signature diamond. The ideal cut diamond is cut to “ideal” mathematical proportions in which every facet is placed at exact angles to create an ideal balance between optimum brilliance (return of light to the eye) and the scattering of light, or "fire" (this is the prism effect that separates white light into its spectral colors). To achieve this optimum reflection and refraction of light, the cutter must be willing to sacrifice valuable carat weight to yield a smaller diamond though with superior beauty. Beginning in 1997, Brian and his father, Benjamin Gavin, researched and refined the 90s version of the hearts and arrows design. Their combined knowledge in the fields of cut and light performance, based on five generations of experience, helped them achieve a noted improvement on the standard hearts and arrows design of the day, enhancing the “performance” quality of the diamond, and improving its light reflective performance under all lighting conditions. These enhancements, introduced in 1998, set a new quality benchmark and created a new grading system for the worldwide standard hearts and arrows pattern cut and earned Gavin the reputation worldwide as “The Cutter.” Gavin’s ideal Signature cut is recognized today as the standard that other companies emulate. 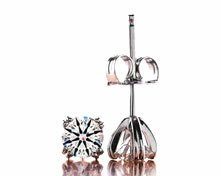 In March 2009, Gavin launched his new Brian Gavin Signature Hearts and Arrows diamonds. These stones are cut to even more exacting standards for quality and brilliance. Every Brian Gavin Signature Hearts and Arrows diamond has earned the coveted AGS 0 grade for Light Performance and was accompanied by the new AGS Platinum Diamond Quality Document introduced in January 2009, and then the Proprietary Light Performance Diamond Quality Document since November 2011. These signature-cut diamonds are optically balanced for maximum visual performance. This signature quality reveals the beauty and personality of each individual diamond. It gives voice to the inner essence of the diamond through its contrast, brightness and scintillation. This is the distinct difference you’ll appreciate in each Brian Gavin Signature Hearts and Arrows diamond. Cut Beyond Brilliant®. Consumers today have become more and more educated and demand perfection in diamond cutting as they do in any other high end consumer product today. They want to know that they have a finely manufactured stone. The advent of the Heart and Arrow effect in the market became a tool for consumers to see perfection in optical symmetry. Since optical symmetry is difficult to quantify because of the variations between each cutter and each stone, criteria need to be standardized for consumers to avoid discrepancies. Therefore just as the Labs grade Color, Clarity and Cut, they should grade the Hearts and Arrows too. Diamond Manufacturers should be rewarded for their excellence in producing an optical symmetrical stone and consumers need to be able to purchase assuredly and with comfort. The perfectly shaped hearts are formed when the main pavilion facets are cut at the correct angles and polished with such perfection in symmetry that their reflection results in a perfect heart pattern. Once the perfect heart pattern has been attained, the perfect arrow pattern in the crown results. Cutting diamonds so that the crown and pavilion angle reflect just the right offset, ensures the highest volume of light return, and a virtual balance of brilliance (white sparkle) and dispersion (colored sparkle) and that the sparkle will be broad spectrum, which means that it is larger in size, bolder, brighter, and more vivid! As a fifth generation diamond cutter, Brian Gavin knows exactly how to cut diamonds to deliver maximum light performance, and optimize visual performance. While other diamond cutters seem focused on cutting diamonds to retain the maximum amount of carat weight, Brian Gavin is intent that every diamond be precisely cut to a degree of craftsmanship that is unattainable anywhere else. Gemological laboratories like the AGS and the GIA grade diamonds for “meet point symmetry” which is based upon how closely the points of the facets align to each other, however even diamonds cut to excellent or ideal symmetry can leak substantial amounts of light, if the degree of optical symmetry is not optimized so that the facets of the diamond are precisely aligned, indexed, and shaped consistently, so that a crisp and complete pattern of hearts and arrows is evident. Every Brian Gavin Signature round hearts and arrows diamond exhibits a crisp and complete pattern of hearts and arrows, which is evidence of superior optical precision! Even the poorest cut diamonds seem to sparkle like crazy when viewed under the pinpoint type lighting conditions provided by jewelry store lighting, we refer to this visual fantasy as the Walt Disney Effect, because it is the direct result of pinpoint type lighting that is designed to make poorly cut diamonds perform well. However if you don’t live in a jewelry store, then you know that the real world lives in a world that is primarily illuminated by diffused light. Brian Gavin Signature diamonds are designed specifically to perform incredibly well under all lighting scenarios, from diffused light, to pinpoint light, and even under lighting conditions where diamonds normally appear not to sparkle! Many people confuse Hearts & Arrows diamonds with standard round brilliant cut diamonds because they share the same basic facet structure. However, this is like saying that a Ford Taurus and a Lamborghini are both automobiles. While that statement is true, Ford and Lamborghini are both cars, there are dramatic differences between a Taurus and a Huracán in terms of performance. The modern round brilliant cut diamond consists of 58 facets including the bottom point known as the culet. Thus, it is possible for any round brilliant cut diamond to exhibit hearts and arrows to some extent. However, it requires an incredible amount of precision to produce a crisp and complete pattern of hearts and arrows. As you can see, each heart is formed from two halves that are created by light reflecting off the pavilion main facet on one side of the diamond, across the diamond where it splits into two halves which reflect off of the lower girdle facets on the opposite side. The slightest variation in facet size, shape, or alignment, skews everything and the hearts will not be consistent in size and shape. Read more about the differences between H&A's and regular round diamonds. 6. Are Hearts and arrows diamond worth it? Who doesn't like hearts and arrows diamonds? How important is diamond cut quality? How do I view the hearts patterns in Hearts and Arrows diamonds? What are dark spots in hearts and arrows images? Why are Brian Gavin hearts and arrows diamonds orange? What color are Hearts and Arrows diamonds? What makes Brian Gavin H&A Diamonds better than the rest? Where can I buy a hearts and arrows cushion cut diamond? The ring is so beautiful that I can't stop staring at it! I had to hold my breath because of how delicate and pretty it looked. 0.85200 J VS1 (CAGS-104104774063) By Salahuddin Zafari on April 17, 2019 Excellent packaging and excellent product. Came with a ring box, magnifier and metal set that was holding the stone even though I didn’t order an actual set. By Bartholomew Lawless on April 09, 2019 An exquisite extension of my fiance's perfection. By Charlotte Gibson on April 06, 2019 Diamond very brilliant. By Lance Logan on March 11, 2019 The diamond was exactly what I wanted. It looked great online, and even better on my fiancé’s hand. By choi butler on January 13, 2019 The diamond was beautiful. By Jihan Mulkan on January 11, 2019 Small diamond... but Black is perfect.